A bee's nest with plexiglass so that the inside is visible. I'm clearly on a bug-kick this week. But how can I say no to bees--I clearly haven't been able to do so thus far this summer. But this was a hive at the Ecotarium (http://www.ecotarium.org/) in Worcester, which I happened to recently visit. 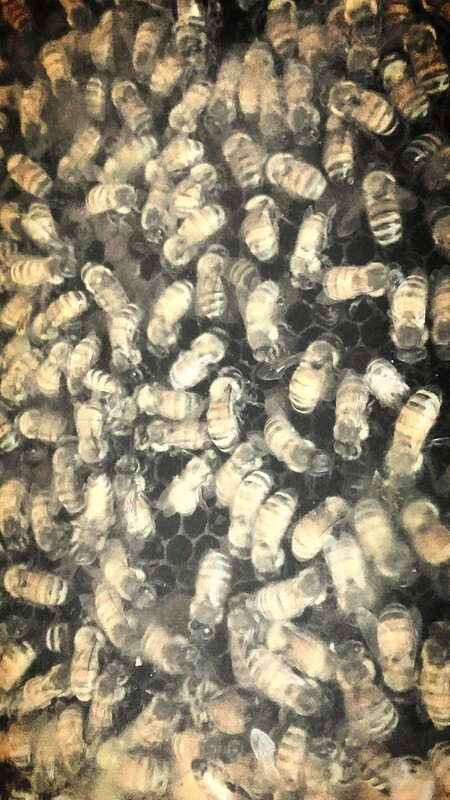 If I find bees fascinating, I find beehives even more curious. All those bees moving about in what looks like utter chaos but somehow, everyone knows what they're doing and the hive gets built, filled with honey, and new eggs. When I look at a beehive, all I can think of it being like a hundred thousand people crammed in a mall and that's always enough to make me turn a bit pale! I like in this photo that you can see both bees that are moving abut and others that are less mobile. I'm also mesmerized by the fact that there are at least some fifty bees in this shot alone.